Recognizing that pull-away accidents are a major source of environmental risk in the cryogenic fluid transfer industry, Mann-Tek has developed a coupling system with technological advancements to counter this risk. Passive security against situations where a hose or loading arm could be subjected to accidental high loads. A simple mechanism without loose components that could be lost after release. Independently operating shut-off safety system that does not require an external power source. Easy on-site reset that requires only one person. Low pressure drop at hookup. High flow rate during transfer. How Do Cryogenic Breakaway Couplings Work? For industrial applications, Mann-Tek Cryogenic CBCouplings® can be installed either at fixed points or in the middle of hose strings. They are typically installed into loading arms or hose assemblies where one side of the coupling is attached to a fixed point. Both halves of the coupling contain a valve that is sealed with O-ring seals. 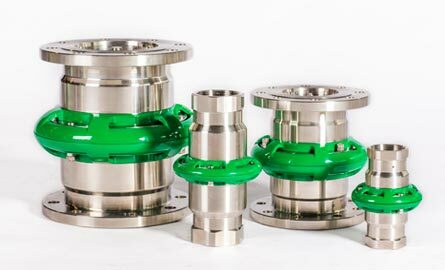 When the couplings separate, both valves close quickly, minimizing spillage and protecting personnel and the environment from exposure to cryogenic gases. Release occurs when tensile pull is applied at an angle up to 90°. Marine breakaway cryogenic couplers are installed between two strings of hose and are designed to release only by inline pull. Materials: Stainless steel. Others on request. Connections: Female NPT, flanged EN and ANSI. Others on request. Contact Arm-Tex today to learn more about the safety benefits of Mann-Tek Cryogenic Breakaway Couplings—or dial 800.536.1983 to request a product demonstration.